Super Mario 4koma Manga Theater is a Japan-exclusive manga, which is a collaboration of various artists, that covers with a few Mario games. Various Mario characters appear, including Mario, Luigi, Princess Peach, Bowser, and Wario. 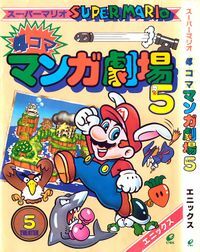 The manga also deals with various games such as Super Mario Kart, Super Mario World, and Super Mario Land 2: 6 Golden Coins, the last of which is also the source of the official artwork seen on the front cover. Unlike other Mario-related mangas, this manga does not follow a story; instead, each page follows a Yonkoma format. The manga was published in 1993. The first few pages of the book are full-color while the next pages are in grayscale. This page was last edited on October 16, 2018, at 20:57.